Ok, we’re not quite ready to say goodbye to our friend the good old classic margarita, but a little company never hurt anyone, especially on Cinco de Mayo. It’s not too late to give your plans a little kick, and we got inspiration from a sweet source the moment @MGFD_MIA’s Instagram fed yesterday’s brunch specials. Pops! Not Hedy Goldsmith’s frosted Pop-T’s we know and love, but frosty pops of the frozen kind that fit summer’s mold just right. So what sort of popsicle flavor combinations are we talking? 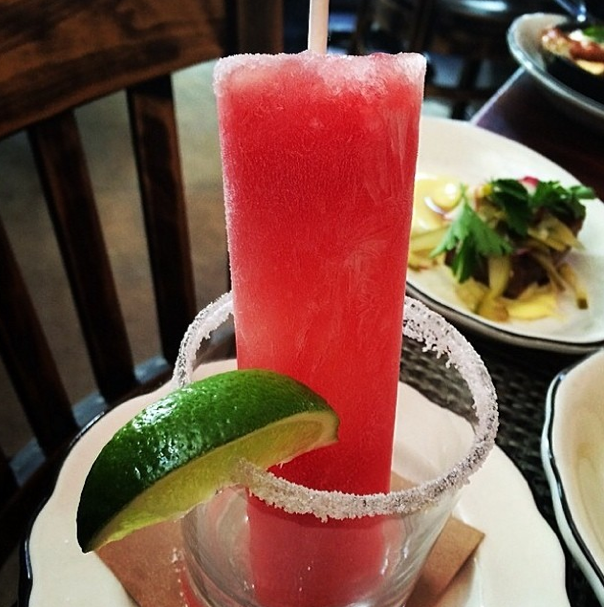 “My all time favorite is the watermelon , tequila and lime,” Hedy says. “I make it year round.” We had seven orders left at the start of lunch today, and thanks to Hedy and her team of Patty Lopez and Devon Braddock in the station, we now have the recipe. Make them when you get home today, and you have a cool surprise waiting in the icebox as the party creeps into the wee hours of Cinco de Mayo. Into the summer, they can be made virgin, too, with no shortage of simply-prepared flavor combinations. Hedy has plenty in mind from peach-basil, cantaloupe-cilantro-lime, and blackberry-bubbles to Thai coconut-ginger-kefir lime, lychee-vodka and mango with everything. What about you? In a large saucepan over medium-high heat, simmer the sugar in 1 cup of water until dissolved, about 3-5 minutes. Remove from the heat and let cool, about 45 minutes. Add watermelon juice, tequila, and lime zest and juice, stirring to combine. Pour into popsicle molds and freeze for 4 hours. Serve in a rocks glass with sugar-dusted rim and a slice of lime. If you can find citric acid, mix it in with the sugar for a tongue-puckering kick!